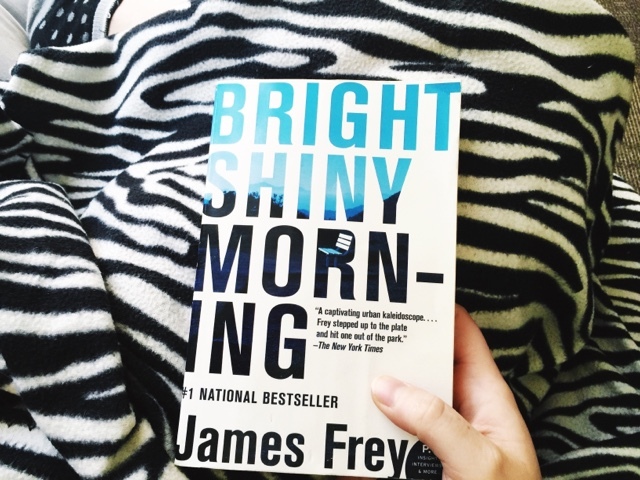 If you tend to follow along on the blog at all, you probably know how much I just love James Frey. I read A Million Little Pieces earlier this year, then read My Friend Leonard shortly after, at which point I ranted on all the hate aimed towards Frey. Anyways, so when I found Bright Shiny Morning at the Dollar Tree, I was thrilled! I bought both Pieces and Leonard at thrift stores and spent more than a dollar, so I couldn't beat the price! When reading Frey's memoirs, I just fell in love with the writing style. I talk about it in both previous reviews, but his style is very stream-of-consciousness, which I'm usually not at all a fan of. (Anyone here a fan of William Faulkner? Yeah, me either!) When Frey uses stream-of-consciousness, it pulls you in. I can't explain how, but it does. In his memoirs, I assumed he wrote in that style since he was writing as himself as a struggling, then recovering addict. The writing style gives a sense of panic and anxiety and as a reader, you tend to just zoom through everything you're reading, because that feels right. So, when I picked up Bright Shiny Morning, I wasn't sure his writing style would be the same, since this is written as a novel. The good news? It was written in the same style, making this book just as easy to read. So, what's it about? (I know, I know. When I write about Frey's books, I tend to go off on a tangent before ever speaking on the book, but we're finally there. I promise.) Bright Shiny Morning is about Los Angeles. It starts off with a disclaimer that states "Nothing in this book should be considered accurate or reliable." which I think is kind of Frey's way of being sarcastic about his previous controversies (see: his memoirs were said to be not all that factual.). It gave me a good chuckle. So the novel is a compilation of chapters about several main characters (a young couple, a homeless man, a celebrity couple, and a maid) and several side-characters that mostly don't even have a name. I've mentioned before I'm not a big fan of short stories, but I tend to like short stories written like this, where they're kind of intermingled. That's not to say that these characters are all a piece of each others lives, but they all have one thing in common - they live in LA. And with this novel, you get several chapters, mixed throughout, of each character, not just one story and you never see them again. In Bright Shiny Morning, you get to know the characters, which is incredibly important to me. Other characters (aka those side characters I mentioned) are mixed into their own separate chapters. For example, there's a chapter on gangs and you get tiny snippets of the life of different gang members. It's somewhat hard to explain, but definitely intriguing. Additionally, between almost each chapter, there's a tiny paragraph with (what I'm assuming is) true facts about LA, steaming from the 18th century through today. Now, I've never been to LA or California at all, but this book sheds a light on the City of Angels (and dreams). It's not a book about how wonderful LA is. In fact, it's quite the opposite. This novel is about how dirty the city is. How it can be dreadful and dream-crushing, but also how people go there to escape, to be famous, to live the American dream. It's really no surprise that the LA Times basically called the book trash. They didn't want it to take away from the insane tourist industry, but truly. I don't think anything could ever do that. It's just a very interesting side to see to LA, one you never see or read about in novels/movies. I would definitely call this novel a must-read. Have you read any of Frey's books? What are your thoughts? I read his other's and that was years ago and I enjoyed them so I'm sure I would like this too. I'll have to check it out...thanks for the review! Yes! If you liked his others, you would like this one too. He has a very prominent writing style, so this is very similar to his others. I read this book a while ago and from what I remember I enjoyed it. But I feel like I would like pretty much any James Frey book, because he's definitely one of my favorite authors. I want to start Endgame series which are written by Frey and Nils Johnson - Shelton, which will be different from his previous books but hopefully just as enjoyable. And I'd also be interested in reading the Endgame series, as well. Okay so, I started reading this years and years and years ago and for some reason I never finished. And I bet any money it's like somewhere at my parents collecting dust now lol. I feel like I couldn't get into it or something, but I LOVED his other two books too. I could have read a million little pieces a million times lol. And I think all the time about how I should stop into Goodwill or something and pick up some books, because you really can find some treasures there! I get bad book hangovers, so it always takes me a couple of chapters to actually get into my next book. But it may have been the switching back and forth you didn't enjoy. His "memoirs" were so entrancing. And you definitely should! I hate spending a lot of money on books, so Goodwill's one of the best places to get them.